HAL Recruitment 2018: For filling up 14 Instructor/Asst vacancies, Hindustan Aeronautics Limited has circulated an announcement for HAL Recruitment 2018-19 on its official portal. Interested candidates can apply for HAL Vacant jobs through offline mode before the last date that is 06th Aug, 2018. Those contenders who want to apply for HAL India Recruitment of Instructor/Asst posts, are required to have a good knowledge of age, qualification, experience require, mode of applying, selection procedure as required by the organization which is mentioned in the official notification provided on its official website. Apply for Hindustan Aeronautics Limited Current Jobs till 06th Aug, 2018!!! To apply for HAL Instructor/Asst Recruitment, contenders need to visit its official portal and download their application by following the steps explained in this page. They will be shortlisted first as per the details mentioned in the application form so they must fill the details carefully. For more detailed information regarding HAL Recruitment 2018-19, applicants must go through the worthy content provided on this page by the team members of www.privatejobshub.in. To be considering eligible for the vacant positions of Instructor and Assistant, applicants are necessarily required to have completed their Graduation and Post-Graduation in relevant fields as per the post they have to apply for. Lower age limit for the candidates applying for HAL India Recruitment is 18 years. Maximum age limit for the same will be decided by the authority during the recruitment process and relaxation on upper age limit will be provided to the reserved category candidates as per the rules of the government. 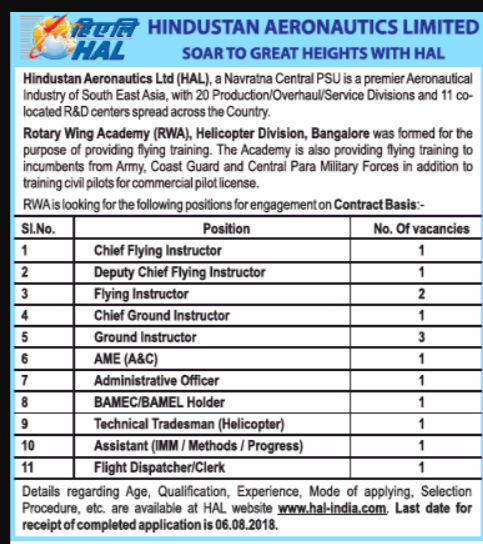 An attractive and sufficient amount of remuneration will be provided to the contenders who will be selected for any of the vacant post under HAL India Recruitment. To get recruited for the Instructor and Assistant vacancies, applicants need to satisfy eligibility requirements and qualify written test/personal interview which will be duly conducted by the selection committee of the authority. To apply for HAL India Recruitment, contenders first need to visit HAL official website that is hal-india.co.in to fill their application form. Then they have to hit “Careers” tab provided on the top right of the home page of official portal. On hitting the above discussed tab you will be navigated to a new page where you will get various recruitment links. You need to search for an appropriate link regarding Instructor/Asst Jobs and press the same. Now on the new page hit the link to get detailed advertisement for HAL Vacancies. Then go through the appeared notification carefully and if you satisfy the entire requirement then go back to previous page and press the suitable link to download application form. Fill the required details in the application form carefully and send it to the organization as prescribed in the notification. Candidates must visit the HAL Official Website on regular basis so that they may not miss out any latest update regarding HAL Recruitment 2018-19. Also, in case of any problem they may drop down their query in the comment box given below.